My husband calls me Meg after a phascogale in an audio story I wrote. The reason is a long story (he thought I was like the character). You can find out more about the project here. I try hard to focus on being brave rather than afraid, but I’m not a fan of big hairy spiders and never will be. There are other big picture answers like global warming, fears that we’re losing habitat for precious creatures like black cockatoos and my fear that our leaders will continue to become less compassionate, but hairy spiders is the short answer. So perhaps the first word has to be tear-inducing. This varies from day to day. I aspire to be Atticus Finch (To Kill a Mockingbird) or Jo March (Little Women) but probably am usually more like The Muddle-headed Wombat. I also have soft spots for Reepicheep (Voyage of the Dawn Treader) and Iorek Byrnison (the armored bear in Northern Lights). And Anne of Green Gables, so many favourites! I feel very fortunate to be living in this age, but if I could easily return, it would be fun to be a fly on Jane Austen’s shoulder and see the events that might have inspired her stories. My mother and grandmother read books and also some poetry to me (Clancy of the Overflow etc). My family also gave books for birthdays and Christmas, as I do now. And I clearly remember my excitement every fortnight when the mobile library bus came to the outer suburbs of Melbourne where we lived. Walking through the front door of the bus, receiving my six library cards and being able to choose new stories was the best thing. I’m sure this love of books and words inspired (and still inspires) my writing. Hope: I’m a bit of a Pollyanna! Dianne Wolfer is an Australian author living on the South Coast of Western Australia. She writes across a range of genres from picture books (see our review of Annie's Snails here) to historical fiction. 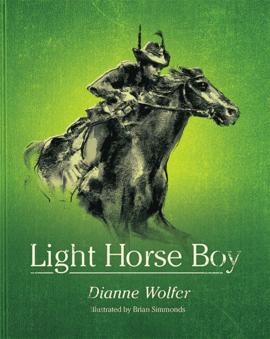 Her latest book for younger readers, Light Horse Boy, is published by Fremantle Press and is shortlisted for the 2014 CBCA Book of the Year Award in the Younger Readers category. You can find out more about Dianne and her wonderful books at her website and blog.